Aveda’s newest shampoo and conditioner has been flying off our shelves ever since it was released earlier this summer. 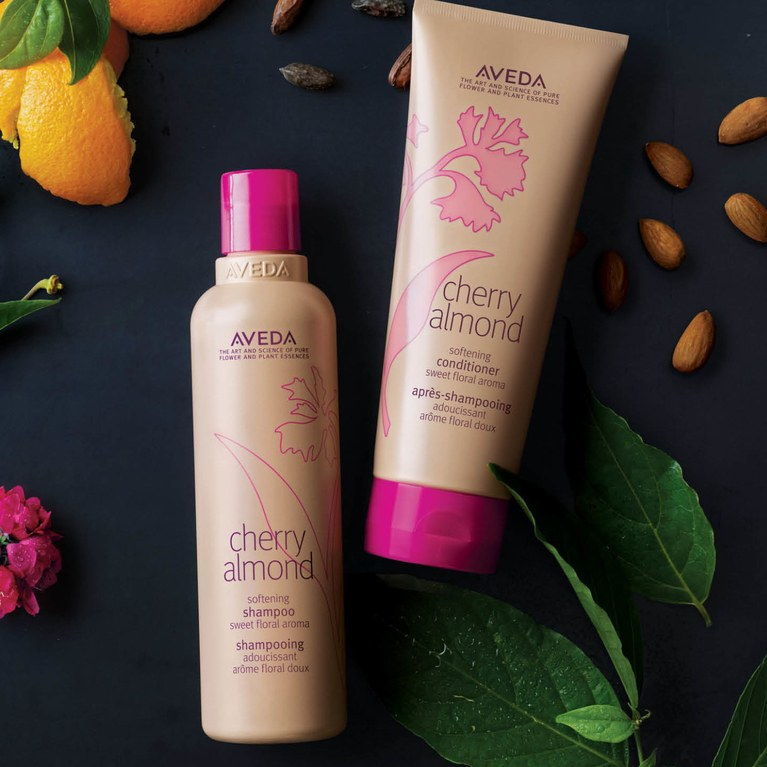 Loyal Aveda customers may remember the original Cherry Almond Bark line. Aveda recently reformulated their classic scent, bringing it back to our shelves. Ever since then, our stylists and clients have been OBSESSED! Who is Cherry Almond for? This shampoo and conditioner is great for all hair types, especially if you like your hair to feel touchably soft. Cherry Almond is a color safe, softening shampoo with a beautiful aroma. It’s classic fruity scent combined with natural ingredients that make your hair soft is what makes this the perfect product for everyone. Whether you’re in need of added moisture or just in love with the smell, we recommend this product to anyone who wants to make their hair smell as good as it looks and feels. Cherry Almond is a budget friendly option for everyone, including kids who just need a shampoo and conditioner to help with tangles. Men and women of all ages have been raving about this line, as it is great everyday product for anyone who wants their hair to feel nourished and smelling amazing. Why do we love Cherry Almond? One of our favorite things about the Cherry Almond line is that is a 100% vegan product. The formula is color safe and does not contain silicone. The sweet aroma is 98% naturally derived from over 38 different aromas including Cherry Blossom extract and almond oil blend. We love that the Shampoo bottle is 100% made from post consumer recycled materials, so you can feel good about what is in the product and how it is made.